Saint Zosimas was a monk from Palestine who lived in a monastery since his infancy. He became famous for his spiritual qualities, but searching for further illumination he went to a new monastery in the desert. The monks of this particular monastery left every year for the desert from the first week of Great Lent until Palm Sunday so as to live in complete isolation. One year, Zosimas saw a shadowy figure in the distance and, chasing after it, discovered a female ascetic by the name of Mary (see April 1st and the 5th Sunday of Great Lent). Mary instructed Zosimas to meet her at the Jordan River on Holy Thursday of the following year to giver her Holy Communion. He did this and was again instructed by her to meet her yet again the next year during Great Lent. Zosimas entered the desert at the appointed time the following year and found the body of the blessed Mary lying dead near the place he first encountered her. A lion approached to dig a grave for Mary, and Zosimas recited the usual burial prayers. He returned to his monastery and spread the news about this blessed woman. Zosimas remained in that monastery until his death the age of 100. 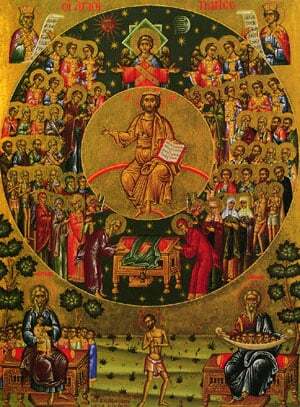 Share the feast of Righteous Zosimas with an icon greeting ecard.